My eighth P2A! In a row, no less. The funny thing is that after my first I left swearing and figured I'd never return... now it wouldn't be spring without it. Last year was a muddy mess. The muddiest P2A of my first 7 attempts - it was just ridiculous. 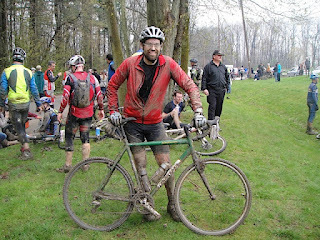 I mean it's always muddy, but it rained right up to the start of the race and everything was soaked... normally dry sections were soupy with mud. This year couldn't possibly be worse, could it? The only saving grace is that organizers have reported cutting out a few sections on account of the mud. I doubt it will change the character of the race significantly, there will still be mud, and lots of it... but maybe we'll get a reprieve now and then too! I can't really say I'm ready for the race this year. My focus has been on running, so cycling has taken a back seat. I've only ridden outdoors a handful of times, and indoors once a week most weeks. So my expectations are pretty minimal. Time is a useless metric in this race, because the course changes every year and the conditions are just as variable. My personal best placing, though, was in 2011 - 316 out of 1188, just outside of the top 25%. Last year I was coming off an injury and plummetted down to 597/1188 - barely in the top 50%. So I'd be pretty happy somewhere in between, top 500 or better. It's not much of a goal, but I can add cracking the top 300 or 250 to 2014. Riding the same bike as the last two years - my Kona Jake the Snake Cyclocross bike. One thing I have changed is the gearing. It had a 46/36 crank and 12/25 casette on the rear, which just wasn't quite enough gears for that last hill! I left the front but changed the rear casette to an 11/28. This gives me extra gears at both ends - the 11 so I won't gear out hammering the flats and downhills, and the 28 for making it up that challenging last climb. The price paid is the gaps between cogs are bigger, but in my training rides it hasn't been noticeable really at all. When I'm climbing that last hill I'm sure I won't be thinking "I wish I still had that 12/25!". Hope all went OK, we've come to expect same-day race reports so hope this race wasn't mudded out. Dnf... broken rear derailleur hanger. Report to come!